She will risk everything to save his life. After thwarting her brother’s plan to wipe out all vampires with a super virus, she thinks she may at last catch a break – until Aden grows ill, and she’s thrown into prison for treason. But a jail cell can’t compare to the thought of losing Aden forever. 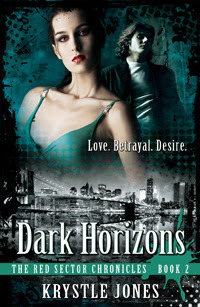 The brilliant vampire doctor Paris De Lange thinks she can manufacture a cure, but she’ll need Orion’s blood to do so. There’s just one problem – Orion has escaped. Now, if Sloane has any hope of saving Aden’s life, she must travel to the surface and bring her brother to justice. But the White Sectors are far from safe. Revolution is brewing, and the control of the White Sector governments grows unstable as the Black Cross Guild creates anarchy in the streets, clashing with the Scarlet Guard and making them increasingly more aggressive. They do have one thing in common – they both want Sloane, dead or alive. With the world rising up against her, Sloane must rely on old enemies that become new allies, uncover the mysteries surrounding her heritage, and conquer her inner demons before the virus has time to claim the man who’s stolen her heart. Starting just where we left off in the previous book, we are off like lightning into a problem that shatters my heart. As Sloan takes off in search of a solution, I thought I might be lost without my forever in the picture. No, this author knows how to keep your interest. In steps Leo. And although I wasn’t rooting for him the beginning, I can say honestly, I was confused about my loyalties by the end. This book is fast paced and filled with action from beginning to end. And yes, there is romance. It’s blended in there so effortlessly, you don’t miss a step between action and love. I can’t say enough about this author. Although this book is about Vampires, this isn’t Vampire Diaries. It’s better. This is a unique blend and twist on an old tale. The story is innovative and different in ways that keep your attention throughout. If you love vampires, this is a must read. If you hate vampires, you’ll love them in this series. I highly recommend. Overall, stellar in all ways. Totally enjoyed. My book boyfriend is Leo in this one. But my forever love is Aden.